Eliza Ross, from T. Kelly (1832). The history of the London Burkers ; containing a faithful and authentic account of the horrid acts of the noted Resurrectionists, Bishop, Williams, May, etc., etc., …including also the life, character, and behaviour of the atrocious Eliza Ross. The murderer of Mrs. Walsh, etc., etc. Credit: Wellcome Collection. My post on this little-known case was published on the British Newspaper Archive blog on 20 October 2017. 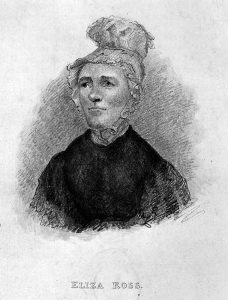 On the night of 19 August 1831 84-year-old Caroline Walsh, a street seller of sewing threads, tapes, and laces, was lodging with 33-year-old Eliza Ross and her partner 50-year-old Edward Cook at their garret in Whitechapel in the East End. She was never seen again. Despite the tireless enquiries of her granddaughters at workhouses and hospitals, there was no sign of her.